The first operational fighter squadron made up of the new £45m Typhoon aircraft has been established at Lincolnshire's RAF Coningsby base. But a ceremony to mark the occasion was delayed when the chosen aircraft developed a problem and could not fly. The project has seen many technical problems, the latest being a faulty environmental control in the cockpit. The squadron is being showcased at an event to mark the RAF's 88th birthday at RAF Cottesmore in Rutland on Friday. The single seat aircraft is designed for combat at high altitudes but can also carry out ground attack roles. The display at RAF Cottesmore was delayed for about two hours after the plane developed air conditioning system problems. 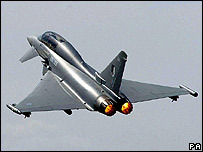 Defence Secretary John Reid, said the Typhoon marked a commitment "to invest in effective fighting power". The event was held to highlight the force's range of changes, which also include the creation of a new naval squadron, a new logistics hub at RAF Wittering and the closure of RAF Stafford, and RAF Sealand, near Chester. Dr Reid said: "Equipping our armed forces with cutting edge, state-of-the-art equipment such as the Typhoon is a high priority. "By pursuing excellence in our equipment, and building training and morale, the RAF soars above the standard and proves itself again to be adaptable, agile and relevant to the threats of the future."